At the beginning of time the idea of darkness and evil is but a mere suggestion. It has no life, no substance, no past, but there is the promise of a future. For as Einstein’s Law of Relativity explains, for every action there is an equal and opposite reaction. If the creator sees fit for good and Light to reign, there too will come a time of evil and Darkness – and so it is prophesied. In the cosmos of immortality and eternity this balance slowly and continuously shifts until the unthinkable becomes reality and the only thing left is the faint promise of hope. 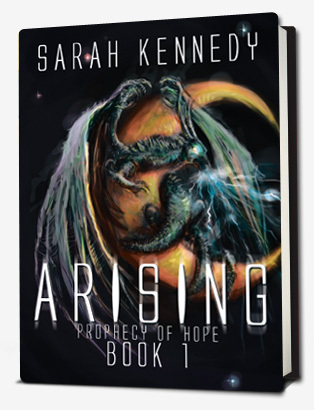 Kennedy’s book Arising looks at the shift of power between Light and Dark, good and evil as it affects the macrocosm, and how manipulation of the seemingly microscopic can influence great portents. The main players here are the creator, god-like beings called Guardians, and immortals who are cursed (the Samhail who long for the light but are condemned to the dark) or chained by their convictions (the Elves who willingly bind their blood to the light at all cost). The weight of the universe is literally on the shoulders of these (and other) characters throughout the book. It is a heaviness made all the more palpable by Kennedy’s use of lofty ideals and even loftier phraseology. The presence of Darkness is inescapable to the point where at its every mention the words on the page are etched by the use of bold and italic fonts. At the end of every major scene and chapter the word is ever-present and foreboding. Kennedy’s takes readers through a losing battle where hope only exists in those made of the Light. It becomes a dream without permanent substance in reality where every instance of its continued existence is weakened and leached from both the characters and the reader. Darkness is perpetuated on such a deep level that readers may find the need to break away from the text in order to breathe without the weight of the universe pressing in on their lungs. I find that Kennedy’s style reflects that of J.R.R. Tolkien in the respect that much emphasis is placed on understanding the past before the present can truly be comprehended. It takes until chapter seven before readers are immersed in a recognizable world and introduced to specific characters who are pivotal to the Arising. While it is easy enough to recognize the various races present in this story (Elves, Centaurs, Faeries, Giants, Sylphs, Dwarfs, etc.) and learn about others with equally readable names, many of the monikers of the characters followed on this ever darkening path are complex and foreign. This may pull readers out of the story as they try to wrap both their tongues and their minds around these new words, repeatedly. Lovers of high, high fantasy with a deep, dark, and disturbing apocalyptic nature will consume this book and absorb its vast expanses, shouldering the growing weight of its ideas until the bitter end. However, for the average fantasy buff, Arising: Prophecy of Hope may prove too lofty in its persistent message, which borders on religious-fanatical, to the point of drowning in the Dark. I am genuinely delighted to glance at this webpage posts which consists of plenty of useful data, thanks for provfiding such information. Unfortunately I’m not one of the Twitter-ati 🙂 I might look into it when my book comes out, but right now I’m strictly a blogger 😉 Thanks for asking!